Congratulations to the winners of Thursday night’s Annual Quest for Pairing Excellence and thank you to everyone who participated! Let’s not delay… here are the winners who make your cooking look like it needs improvement, or is that just me? This team may have had the upper edge, I mean, who knows the wine better than their own restaurant? But their pairing of the 2014 Small Lot Serenity with berkshire pork sausage with bing cherry mostarda and Riesling fermented kraut ensured that they were ready for victory! The team paired their 2013 Chateau Molyneaux Merlot with wedding cheeks with a charred Korean pepper soubise, crisp potato and pickled red daikon. Difficult to imagine it all together, but this definitely had us going back for more! This team paired their 2013 Roberitage, 50% Syrah 50% Cabernet Sauvignon with minced chicken in lettuce spears with a sweet hoisin sauce. Oh my! One of the best things about this dish was that it was delicious and savory without being heavy. Our panel of judges consisted of Linda Carruci, Culinary Instructor and Author, Fred Swan, Wine Writer & Educator at San Francisco Wine School and Deborah Parker Wong Journalist & Educator for The Tasting Panel, SOMM Journal and Clever Root. While they may be the experts, our guests voted the following as their favorites. 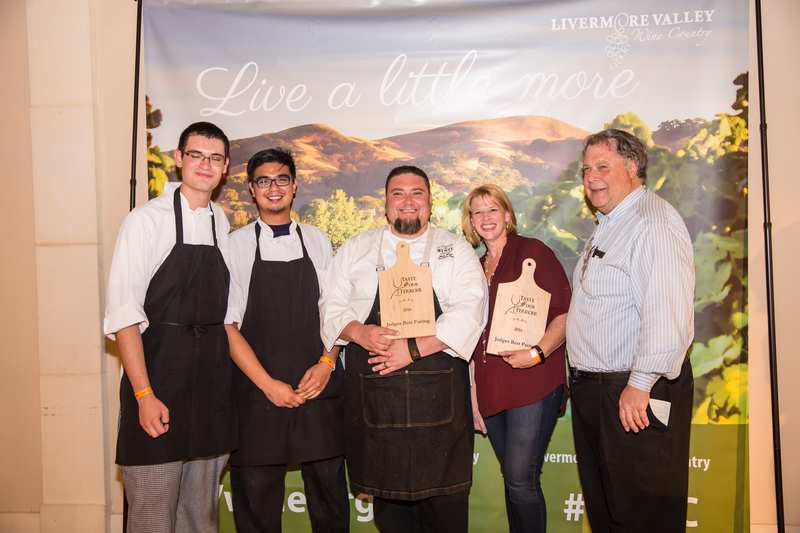 This team paired the Cabernet Sauvignon with a 12-hour house smoked dry rub brisket with homemade smoky paprika pimento cheese in a crispy risotto shell. And let me tell you, every hour that was put into this pairing was worth it.